We’ve all got at least one phone rant in us. This is mine. It all started several years ago. A kind relative gave the Muffet a mobile phone, as she’d be travelling to school by train. The problem was the provider. Vodafone. Apparently they’re very good if you happen to be standing under one of their towers, but don’t think you can call your parents from pony camp. Or from inside a building. The other thing about Vodafone is that they lock their phones so you can’t get a different provider. They do provide a method for unlocking the phone, which I followed to the letter. It didn’t work. I went up to a Vodafone shop and explained my dilemma, and you can imagine that they were of no use at all. 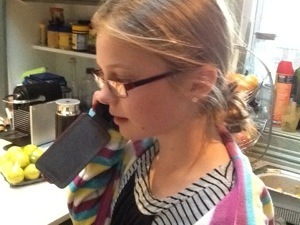 There was an option that involved posting the phone to Tasmania at my own expense, but that wasn’t for me. As my nostrils started to flare and my voice got softer I noticed the manager sidle into the store cupboard. No, really. The woman trying to help me leaned forward and said “you know, that guy that sells phone cases downstairs hacks phones to unlock them. Your best bet is to go to him”. The hacker downstairs said his services were too expensive for a basic phone like this, I should just buy a new phone from Telstra. I did just that. The Muffet lost it almost immediately. The second instalment came when another kind relative gave the Muffet a Galaxy that had become surplus to requirements. I don’t know what it is about the Muffet, I think it’s the blonde hair. And she’s very charming. I immediately opened up the phone and was relieved to find an Optus SIM nestled in it. All I needed now was a Telstra prepaid pack and we were communicado again. I went up to Woolies and asked for a prepaid SIM pack. “Nah, love, we only do recharges” said the friendly lady. “Would you care to turn around and give me that pack behind you that says “Telstra prepaid SIM card starter pack? No, not the nano SIM. Regular. It’s orange.” We got there in the end. No, it didn’t work when I inserted it and followed the activation steps. Two phone calls to the help desk resulted in a lot of Indian accented humming and hawing and finally a suggestion that I take it into a Telstra shop. The Telstra shop also did some humming and hawing and finally asked “are you Alexis Henderson of Castle Cove?”. No, I’m not, and neither would I have lent Muffet’s phone to him if I had ever met him. Well, at least I got to deal with the actual manager, and he was kind enough to say he’d never come across this problem before. You know how he fixed it? Just redid the activation. “Ah”, I said. “The help desk effect”. “You’re familiar with it?” “Oh yes, I used to be a help desk”. “We’ll, I don’t know why it worked, but thanks for showing me a new problem”. Anything I can do to help. I just love spreading sweetness and light.